I've been doing 100 meter dashes at my old high school in hopes of increasing my burst speed and sprint in general as well as building some muscle in my legs. I find that after going all out for 3 sprints, I am exhausted and my legs will be extremely sore for the next 3-4 days. I do stretch a little before the running, as well as a 1/4 mile warmup run. I stretch my legs after the run as well. 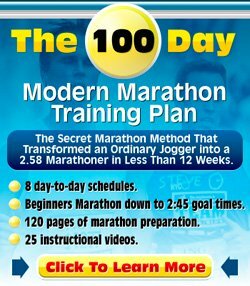 What is the best way to increase my sprint speed if my legs are going to be sore for 3-4 days after the run? Should I run while the soreness seems to wearing off? Thanks for your running training question about increasing sprint speed. I can help you a little bit (I think), but need to stress that my main focus has always been middle to long distance running. When I was younger I was a very fanatical soccer player though, so I do know a little bit about sprints as well. It may be best however to find a specialized sprint coach and get some detailed advice from someone who knows, not sure if there are any "sprint websites" around that provide advice. Your current routine of doing 3 sprints every 3-4 days will not help in making you much faster. There are not enough training moments in the week, nor is the training long enough. I would start off with a longer warm up run of about 4 laps of easy running around the track. So that's about, at least, 8-10 minutes of easy running (never mind if it takes a bit longer than that). Easy running is the pace at which you can maintain a conversation with someone else. During your sprints you build up lactic acid in your legs. If left like it is, you will feel that for at least 1 or 2 days afterwards. It is best to do a cooling down via about 5 minutes of easy running and then to do some running stretches. In the days afterwards do some gentle running and/or walking as well. These actions will help clear the lactic acid faster. Have you ever had a look at the bodies of sprinters and compared them to long-distance runners? The greatest long-distance runners of our time (Haile Gebreselassie, Bekelele, Paula Radcliffe) are skeletal compared to sprinters who look more like body builders. Check out weight exercises you can do to make your upper legs and core stronger. This does not have to be with weights only. Uphill cycling or pedalling while standing on the bike for example are good exercises for your quads, as are prisoner squats. Plyometrics are all about explosivity and becoming stronger and faster. Search the net for some plyometric exercises. One thing all runners should do regularly after their easy runs is running strides. These are non-strenuous short dashes that focus on quick leg turnover. It helps your running economy and makes you faster. I would advice using some of the stuff above to create longer workouts, e.g. do a longer warm-up, then do some plyometric exercises, (body)weight exercises and running strides, then do shorter sprint efforts, then maybe do some longer (100 metres) sprints, then cool down and stretch. You need to find a way in which you can do your training longer and more regularly, so see what works for you. I hope I have given you a few things to think about. By no means take this as gospel, as stated before, sprints are not my main area of interest.